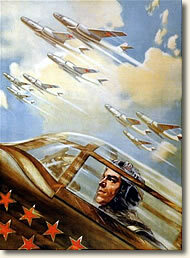 In the early 1950s the Red Army had 30 divisions based in Germany. What were the Soviets up to? Did they plan to invade Western Europe? British and American efforts to answer these questions had been stymied by their inability to crack the Russian military and diplomatic codes. The British and Americans desperately desired information that would provide an early warning of any Soviet attack. They devised an audacious plan to get it. They would build a quarter-mile-long tunnel from Berlin's American sector to the city's Soviet sector and tap into the underground telephone cables that carried conversations to and from Soviet military headquarters. CIA Director, Allen Dulles, approved the top-secret plan in January 1954. It would be a joint CIA and British SIS operation. Work began immediately. Cover was provided by building a new facility next to a Berlin airport close to the dividing line between the American and Soviet sectors. Disguised as a radar installation, it provided the starting point for the tunnel and a hidden dumping ground for all the dirt created by the excavation. By May 1955 the tunnel was completed and the Russian cables containing an estimated 1200 telephone lines were tapped. It was a mother-lode of information that kept 650 translators and analysts based in Washington and London busy around the clock for the next three years. It was not to last. In the spring of 1956 heavy rains inundated Berlin saturating the earth and interrupting the service of a number of cables. In the early morning hours of April 22, 1956 the American spies watching from their disguised location were horrified to see a team of German workers digging directly above their tunnel. Within hours the tap was discovered and the listening devices shut down. But, was the discovery the result of a freak accident of Nature? What the CIA and SIS didn't know, or even suspect, was that their plan had been compromised from its very beginning. A "mole" had infiltrated the SIS. His name was George Blake and he had been recruited as a Soviet spy while he was being held prisoner during the Korean War. After his repatriation, Blake joined the SIS and assigned to the team developing the tunnel. He reported the plan to his KGB masters even before ground was broken. However, the murky world of international espionage often works in strange ways. It was discovered after the collapse of the Soviet Union that the KGB never revealed the existence of the tunnel to their military comrades for fear that closing down the operation might alert their American and British adversaries to the existence of a mole within their ranks. "At approximately 0050 hours on 22 April, 40 or 50 men were seen on the east side of Scboenefelder Allee, deployed along the entire area observable from our installation, digging at three to five foot intervals over the location of the cable and, incidentally, the tap chamber.
. . . The work of excavation continued, and fragments of conversation connected with it were picked up by the tap chamber microphone. . . .A German remarked that the chamber might be connected with sewage work and proposed that plans of the sewage system be obtained. . . The Russian answered that they already had this information and the plans showed 'that chamber' to be 120 meters away from this point. At about 0320 hours, when still more of the tap chamber was revealed and a better view of the interior obtained, those present began to speculate vaguely about its exact nature and the time of its construction . . . Shortly after 0330 hours, the Soviets left the site by motor vehicle, presumably to report their findings. At approximately 0415 hours Vyunik [Colonel Vyunik, Chief of the Soviet signal center in Berlin] telephoned Alpatov's apartment [Major Alpatov, a KGB officer] and asked Alpatov if he had spoken with General Dudakov [Chief signal Officer of the GSFG]. Alpatov said that he had, that he was getting dressed, and that he would go to his signal center as soon as possible. Vyunik told Alpatov to telephone him at the GSFG frame room as soon as possible. Adding, 'When we speak we must do so carefully. We know what the matter is, so will speak carefully.' This indicated clearly that by 0415 hours the GSFG Signal Directorate and General Dudakov, the Chief Signal Officer, had been informed of the discovery of the PBJOINTLY chamber, viewed it with extreme suspicion, and planned to re-route circuits passing over the target cables.
. . . Between 0700 and 0800 hours a number of additional Soviet officers arrived at the excavation, including Colonel Gusev of the KGB Signals Regiment. A Russian-speaking German was heard to remark that a 'commission' was expected, and a Soviet officer said that they would await the arrival of this commission before making a decision as to what the next step would be. Conversations reflected that all present realized that the planning of the tunnel approach to the cables must have necessitated a very detailed study of relevant maps and plans. Between 1515 and 1530 hours the tap wires were cut, and at about 1545 the attention of the Germans began to concentrate on the microphone itself. . .At 1550 hours work began on dismantling the microphone. Shortly afterward the microphone went dead and, after 11 months and 11 days, the operational phase of PBJOINTLY was completed." This account appears in CIA Historical Paper no. 150, Clandestine Services History, The Berlin Tunnel Operation 1952 - 1956 (1968, declassified Feb., 2007); Martin, David C., Wilderness of Mirrors (1980); Stafford, David, Spies Beneath Berlin (2002). "The Russians Discover a Spy Tunnel in Berlin, 1956" EyeWitness to History, www.eyewitnesstohistory.com (2007). The plan for the Berlin Tunnel was based on an earlier, but less ambitious, tunnel the British had built in Vienna in the late 1940s. The Vienna tunnel ran between the British and Soviet sectors of the city. At the beginning of the operation, the Americans and British theorized that if discovered, the Soviets would not reveal the tunnel out of embarrassment. They were wrong. 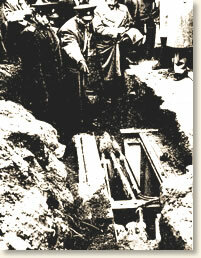 Two days after their discovery, the Soviets called in western reporters to inspect the tunnel. The British and Americans denied any involvement. However, the reporters discovered the following label on the water pumps used in the tunnel: "Goulds Pumps, Seneca Falls, NY." The Soviet spy George Blake was exposed in 1961. Convicted of espionage, he was sentenced to 42 years in prison. He escaped from prison in 1966 and fled to Russia where he still lives today.